I've been churning out two reviews a day to keep abreast of my to-do list and I'm still barely caught up. (There's now only a 2-month wait time between when I get a song and when I write about it here!) My point us, what makes it up here is a fraction of a percentage of all of the music I actually listen to. 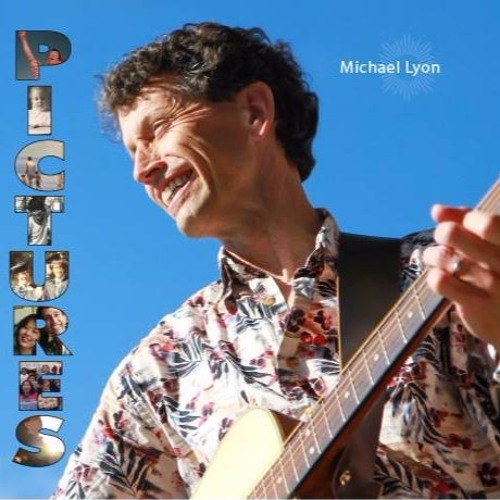 So when I came across Michael Lyon, I was immediately struck by the music's...purity. Happiness is not a popular subject in literary fiction. We struggle, as writers, to make happiness, contentment, and satisfaction interesting. Perfection often lacks texture. What do we say about that smooth surface of idyll? How do we find something for narrative to hold on to? Or, perhaps, we fail to see how happiness can have texture and complexity so we write about unhappiness. Michael Lyon does not have that problem. Pictures is whimsical and practically vibrating with contentment. Unlike a lot of other similar music that crosses my Inbox, Pictures is simplistic in its emotional impact but not because the songs are. A lot of "happy" music I find tends to be a bit manic, almost certainly drug-induced, or childish. In Pictures, Lyon shows us that happiness just isn't that complicated. Sonically, Pictures feels a bit like a throwback -- essentially, if Peter, Paul, and Mary had a jam session with Neil Diamond, here's what you'd get. Clear-eyed but with a sprinkling of kooky sound effects and interludes just to keep things interesting. Especially these days, Pictures allows us to put our burdens down for a moment and let life be uncomplicated and, even, enjoyable.